Product code: ES935 Categories: Sold Items, Sold Rings. 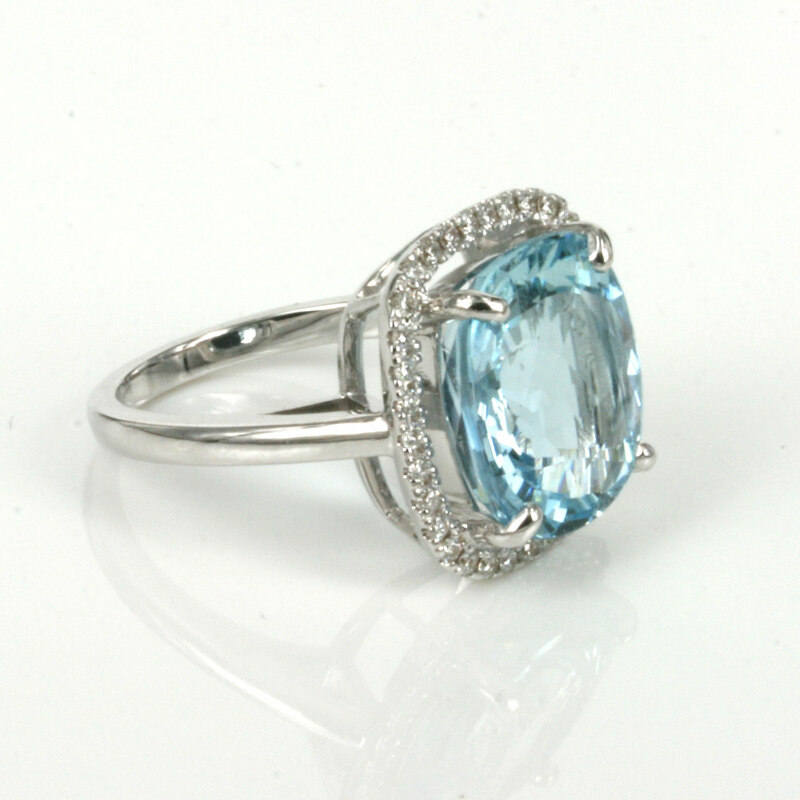 Here is an aquamarine and diamond ring that is truly spectacular and will certainly stand out day or night and always be admired. Cut as a wonderful antique cushion cut, the colour of the aquamarine has that perfect pure blue colour that is so desired and measures 8.34 carats in weight. The cut, colour and weight of this aquamarine alone is wonderful and has been set into a setting to show all of its beauty to its maximum potential. Set in 18ct white gold, the aquamarine is surrounded by a total of 34 round brilliant cut diamonds that totals 0.34 carats and add just the right amount of sparkle to the ring without taking away any of the natural beauty of the aquamarine. The setting of the diamonds measures 17.1mm across by 17.8mm and looks fabulous on any finger. 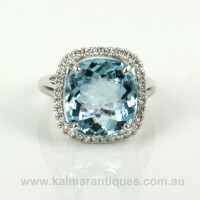 Aquamarine means “Two hand fulls of (sea) water” or “Water of the sea”, and when you see the spectacular colour of this aquamarine especially when it is on your finger it will be so easy to see where the name came from.